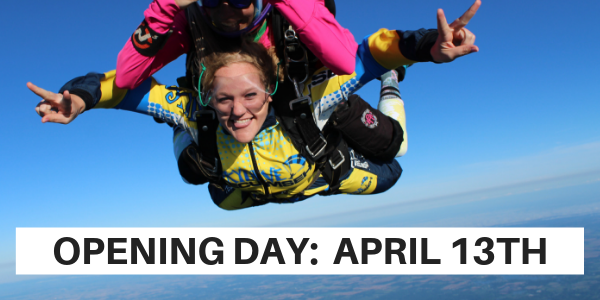 At Skydive Tecumseh, we recognize that going skydiving is a BIG DEAL! And if it’s your first time skydiving, you probably have a lot of questions. The good news is Skydive Tecumseh has been helping people experience human flight for more than 50 years and our experienced team is ready to answer just about any question you may have. In fact, we’ve compiled a list of our guests’ most frequently asked questions below to help you prepare for your upcoming skydive. We want you to have the best skydiving experience possible so we recommend that you review the questions below prior to jumping with us. If you have additional questions, please feel free to contact us! Yes, you must legally be 18 years of age or older to skydive in the United States. Our apologies, but there are no exceptions to this rule. Even if parents give parental consent for minors to skydive, it is still not permitted. Skydive Tecumseh requires government-issued photo identification (generally a driver’s license or passport) to participate in skydiving activities. Is there a maximum age limit to make a skydive? There is no recommended maximum age to make a skydive. We have hosted guests from 18 to 98! We are more concerned with health, strength, and flexibility. Please note, we do reserve the right to deny anyone the ability to make a skydive at Skydive Tecumseh if we believe safety is being compromised in anyway. All guests cannot weigh more than 230lbs. This weight should factor in clothes and shoes. Guests should be height / weight proportionate. Weight restrictions are established by manufacturers’ equipment restrictions. Please note, we do weigh all guests prior to jumping to ensure weight requirements are met. Can you accommodate individuals with physical limitations? We treat each individual on a case by case basis. If you wish to skydive, but have physical limitations, please call us. Depending on the condition, we would wish to schedule an appointment, meet you and evaluate whether physical limitations presented will not compromise safety. If you’re making your first skydive, you’ll have lots of questions (at least we think you should, as you’re jumping out of a plane!). We have tried to build our FAQ’s to be the most comprehensive of any skydiving center in the world; so if you can’t find the answer to your question here… please call us at 1-517-423-7720. Please note, all sales are final. We do not offer refunds. Purchases are transferable and are valid for 5 years from the date of purchase. If needing to reschedule, please contact us 5 days prior to your skydive so that we may reschedule you with ample time to allow someone else to fill your slot. What clothing is required for making a tandem skydive? Wear comfortable clothing that suits the weather. It is very important that your clothing not be overly loose or baggy. Avoid shirts with collars and hoods, or any other parts that may flap around. Avoid tank tops. Wear tennis shoes that lace up. No open-toed shoes, sandals, boots, or other shoes with hooks. Do not wear any loose jewelry or anything you wouldn’t wish to lose. Should I eat or drink before making a skydive? It’s important that everyone eats a sensible meal before making a skydive. Often, many people don’t eat in fear of being sick, when in fact, this is the worst thing you can do. Stay hydrated and eating according to your normal schedule is generally the best approach. How long should I plan to be at the dropzone? Please be advised that this is a whole day activity – Plan on spending at least half a day (over 4 or 5 hours) at the dropzone. There are things that are beyond our control that may cause a delay with your jump. If there is a delay in the morning all jumps will be made in order of earliest appointment forward. Please allow yourself an adequate amount of time and don’t schedule for a day when you have a time constraint. We want you to enjoy your experience and not be concerned about running late for school, work, etc. Is it okay to skydive if hungover? No. We ask you not consume any alcohol after midnite the night prior to making your skydive. If we sense you are intoxicated or hungover, we will not permit you to jump. Please remember, this is not a roller coaster ride and requires the active participation of both the instructor and you, the guest. Any impairment is a safety risk. Can I bring guests to watch me skydive? Absolutely! We do have a spectator-friendly dropzone with picnic tables that you and your guests are welcome to use. We also encourage you to bring your own lawn chairs, blankets, etc. There are plenty of wonderful local restaurants within a 5 minute drive from the dropzone – or feel free to bring a picnic. However, please warn any guests you have coming to watch that there may be considerable wait times. Please consider bringing something to keep you and your guests entertained, and our staff can always recommend local restaurants and other attractions while you wait. If I have a friend who would like to join me for a skydive, but doesn't have a reservation, can you accommodate them? Ideally, give us a call to see if we can accommodate your guest as our flexibility is based on variables such as staffing and weather conditions. We often take walk-ups, but give priority to those that have reservations first. What altitude does Skydive Tecumseh jump from? We offer our guests three different altitudes: 9,000′, 14,000′ and 18,000′. Because you don’t feel like you’re plummeting to earth (you’ll feel as if you’re floating) it’s a really enjoyable experience that you’ll wish lasted for as long as possible. Not to mention that first skydive goes by in a flash. To read more about the differences in altitude, click here. What kind of aircraft does Skydive Tecumseh fly? Skydive Tecumseh has one of the fastest jump aircraft in the country – a Beechcraft King Air. The advantage of the King Air is speed. The aircraft takes our guests up to 14,000 feet in just under nine minutes. Within the skydiving world… that’s super fast! If you don’t love riding in planes, this is the best option for you as you’re not in it for long! Another huge advantage of jumping from the King Air is that it is a multi-engine aircraft adding additional safety. Should you skydive while pregnant? Women are discouraged from skydiving while pregnant. No two skydives are alike due to multiple variables that are continuously changing. Skydivers may experience firmer openings (known as opening shock) than other jumpers or may have different kinds of landings due to variable wind speeds. Some landings can be firmer than others. It is suggested by most medical professionals that skydiving while pregnant is not recommended. If you have any doubts please consult your doctor. Can you skydive if you have a cold? Skydiving with a head cold is not recommended and could potentially cause serious hearing and sinus damage. Due to the change in pressure from a high rate of descent (a descent rate of approximately 1000 feet every six seconds), sinus pressure can build up and may cause serious damage to an individual’s ear drum which is extremely painful. If you are suffering from a head cold, you will not enjoy your skydive. Please contact us to reschedule. The number one cause for irritation to every skydiver in the world is the weather. Mother Nature rules the day! We ask all of our guests to be patient if there are delays or cancellations associated with weather conditions. As a business, we are only profitable if we jump. However, safety will not be compromised. We ask for your patience as weather delays are beyond our control. If unsure about weather conditions, please call us at 1-517-423-7720. It is better to be on the ground wishing you were in the sky than to be in the sky wishing you were on the ground! Am I guaranteed to make my jump on the scheduled day? Unfortunately, we are not able to guarantee that you’ll be able to skydive on the day of your scheduled jump. Our number one priority is your safety and unfortunately Mother Nature dictates whether we can jump on any given day. For example, we will not jump through clouds and in high winds for safety reasons. If the weather is questionable please call ahead to verify that we are jumping. If there is a weather hold at any time during the day the earliest appointments will be served first. What if I am not able to skydive on my scheduled day due to weather? The If you are unable to jump due to weather, we will reschedule you for another convenient date and time. What weather conditions affect making a skydive? Do you offer wingsuit skydives? We do regularly have wingsuit instructors on the dropzone for experienced skydivers, however this is not an option for a first jump. There is a 200-jump minimum for wingsuit training, due to the added complications of jumping with a wingsuit. If your question has not been answered here, just give us a call at 1-517-SKYDIVE / 517-423-7720 for more information. Tandem skydiving is a parachute system and harness developed for two people. Utilizing a harness built for an instructor and passenger, individuals with no skydiving experience can experience the thrill of free fall with a professional instructor. The parachute systems used for tandem skydiving are significantly larger than those used by ‘sport skydivers’ and usually range between 330 and 400 square feet. Freefall is not the “roller coaster drop” feeling most people expect it would be. It is a comfortable sensation of floating and support, with a slight pressure of air against your body. Imagine what it feels like when you hold your arm out of the car window on the freeway. Freefall is the closest thing to human flight, especially when falling “relative” with other skydivers. In relation to other skydivers in the air, a jumper can move forward, backwards, up, down and all around in the sky. The constant air flow allows aerial maneuvers with precision and control. What is opening and flying the parachute like? The “opening shock” of a parachute is much like jumping feet-first into a pool of water. The opening takes about two to five seconds and is not uncomfortable. Unlike the traditional military “round” parachutes you may be familiar with, our modern “square” parachutes are simple to maneuver and steer to the ground. Steering lines are attached to the right and left side of the parachute. By taking the controls in each hand, one steers the parachute intuitively by pulling on the controls. To turn left, the pilot will simply pull down the left control, then return the control to its original position to stop the turn. With the new, modern square parachutes, a proper parachute landing is now much like stepping off the curb. Parachutes used by tandems and beginners are much larger and more docile than an experienced jumper’s parachute. Thus, landings are generally soft in most conditions. In most cases you’ll slide in on your bottom, or even stand right up. How qualified are tandem skydive instructors? In 2015, the United States Parachute Association (USPA) recorded 21 fatal skydiving accidents in the U.S. out of approximately 3.5 million jumps. That’s 0.006 fatalities per 1,000 jumps—among the lowest rate in the sport’s history! Tandem skydiving has an even better safety record, with 0.002 student fatalities per 1,000 tandem jumps over the past decade.